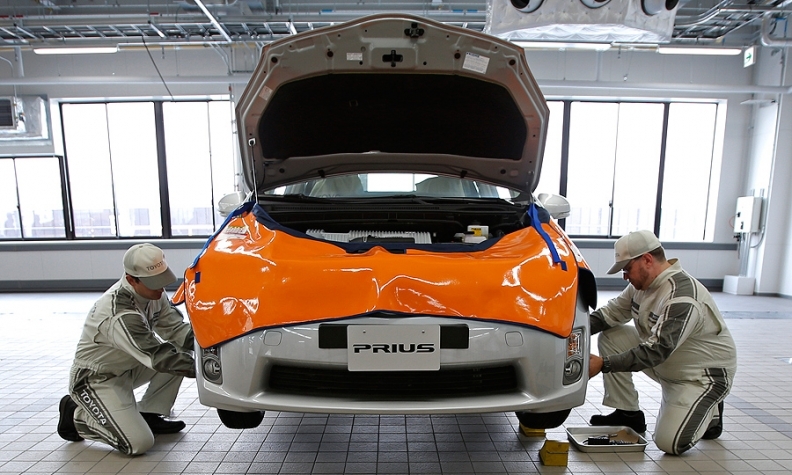 Trainee after-service staff work on a Prius during a maintenance training demonstration today at the company's Tajimi Service Center. Toyota Motor Corp. today marked the completion of a $90 million training center in Japan aimed at boosting the skills of Toyota mechanics at dealerships around the world. The Tajimi Service Center will train about 2,600 mechanics per year at first, and 4,800 a year eventually, the automaker said. The center is part of Toyota's efforts to avoid costly recalls such as those in 2009-10, when the company recalled millions of vehicles. "Customer service is essential to us. We must raise the level of our repair and maintenance skills, serve the customer from the customer's viewpoint, and communicate thoroughly so that we can provide service directly to the customer faster and more accurately," Toyota President Akio Toyoda said in a statement. The center, in Tajimi City, includes a test course that simulates 13 driving conditions, including bumpy roads, cobblestones and wet surfaces. In addition to training dealership aftersales service staff, the center will perform r&d in repair and maintenance technology, the company said. "No vehicle is used in the same way, and all sorts of things happen that cannot be anticipated at the development stage," Toyoda told Yahoo Finance. "It is impossible to build a vehicle that will never break down." Other automakers have similar training centers, and Toyota has another one in Nisshin City, Japan, but the new four-story center is one of the largest for any automaker, Yahoo Finance said. Toyota's U.S. sales in June rose 10 percent from a year earlier, to 195,235 units. Through the first six months of the year, the company's U.S. sales were up 6 percent from the same period a year ago, to 1.1 million units.